This Veterans Day, November 11, 2018 marked the 100th anniversary of the famous cease fire which heralded the end of World War I. In 1918, an armistice (temporary cessation of hostilities) was declared between the Allied nations and Germany in World War I. The armistice was signed on the 11th hour of the 11th day of the 11th month. Though the Treaty of Versailles, which marked the official end of World War I, was signed on June 28, 1919, the general public embraced November 11, 1918 as the end of the conflict. President Woodrow Wilson proclaimed November 11 as the first commemoration of Armistice Day in 1919. The United States celebrated with parades and other public events. At 11 AM, business and school activities paused in remembrance of the armistice. Many of the Allied Nations also held Armistice Day celebrations. On November 11, 1920, unidentified soldiers were laid to rest at Westminster Abbey in London and at the Arc de Triomphe in Paris. The following year, also on November 11, an unidentified American soldier killed in World War I was buried at Arlington National Cemetery near Washington, D.C. 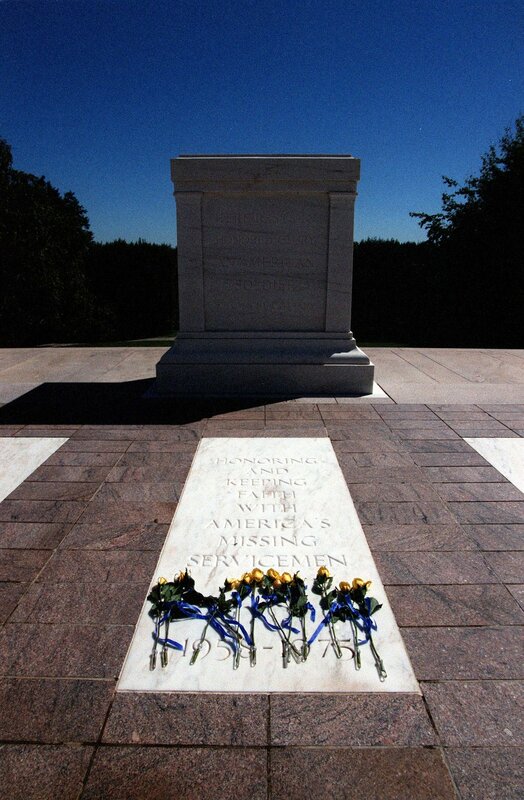 Since 1921, the intent was to add a monument over the grave and the Tomb of the Unknown Soldiers was eventually completed on April 9, 1932. The memorial consists of four panels representing North, South, East and West. The Tomb was placed at the head of the grave of the World War I Unknown. West of this grave are the graves of the Unknowns from World War II and Korea who were selected by order of President Dwight D. Eisenhower. 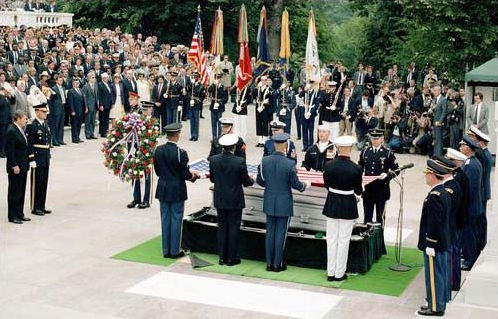 An Unknown from Vietnam was placed between these two graves; however, his remains were positively identified in 1998 through DNA testing as First Lieutenant Michael Blassie, United States Air Force. Blassie’s remains were removed and returned to his family for burial. The meaning of the four panels has changed since the original inception of the monument. The North and South panels have three wreaths on each side which in 1931 represented “a world of memories,” but later came to represent the six major battles involving American forces in France: Ardennes, Belleau Wood, Château-Thierry, Meusse-Argonne, Oisiu-Eiseu, and Somme. Each wreath has 38 leaves and 12 berries. The East panel faces Washington, D.C. It features three Greek figures representing Peace, Victory, and Valor. Rain or shine, an official wreath-laying ceremony is held each Veterans Day at the Tomb of the Unknown Soldier in Arlington National Cemetery. Parades and other celebrations are held in states around the country. November 11th became a federal holiday in the United States in 1938. After World War II and the Korean War, Armistice Day became known as Veterans Day. Unlike Memorial Day which specifically honors soldiers killed in service to their country, Veterans Day is a U.S. legal holiday in recognition of all American veterans—living or dead. It especially gives thanks to living veterans who served their country honorably during war or peacetime. Great Britain, France, Australia and Canada also commemorate the veterans of World War I and II during the month of November. Canadians observe Remembrance Day on November 11. Britain has Remembrance Sunday on the second Sunday of November. Europe, Great Britain and the Commonwealth countries commonly observe two minutes of silence at 11 AM every November 11. History.com Editors. “Veterans Day 2018.” HISTORY, https://www.history.com/topics/holidays/history-of-veterans-day. A&E Television Networks. October 18, 2018, accessed 1 November 2018.